Last month I was fortunate enough to be a participant in a workshop with John Salminen. Not only is he an incredible painter-her's a great teacher, as well. The workshop topic was "Urban Landscapes." 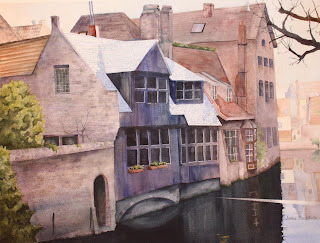 I painted this from a photo I took when we visited Bruges, Belgium last May. The rooftop on the dark house at left is actually covered in orange glazed tiles, but John suggested that I leave it white and shade it with the mouth atomizer technique. He was right-the bright orange would have overwhelmed the rest of the painting. Overall, the piece turned out...okay. I wish I had selected a different subject. (He did pick this one from the photos I brought-so he's culpable, too! )I will try to get back into posting mode on a more regular basis-it helps me stay focussed on painting. This is lovely, how fun you were able to take the workshop! So Great Janice! Love the reflections in the water, and subject. So awesome you took his workshop, I was looking at his dvd's for sale the other day and thinking I'd like to take a workshop class from him. Miss you girlie! Nice to hear from you girls! I highly recommend John's workshops if you ever have an opportunity to take one. He's in great demamnd and won't be back a SCVWS until 2014 or 15. Hope to see you both soon.